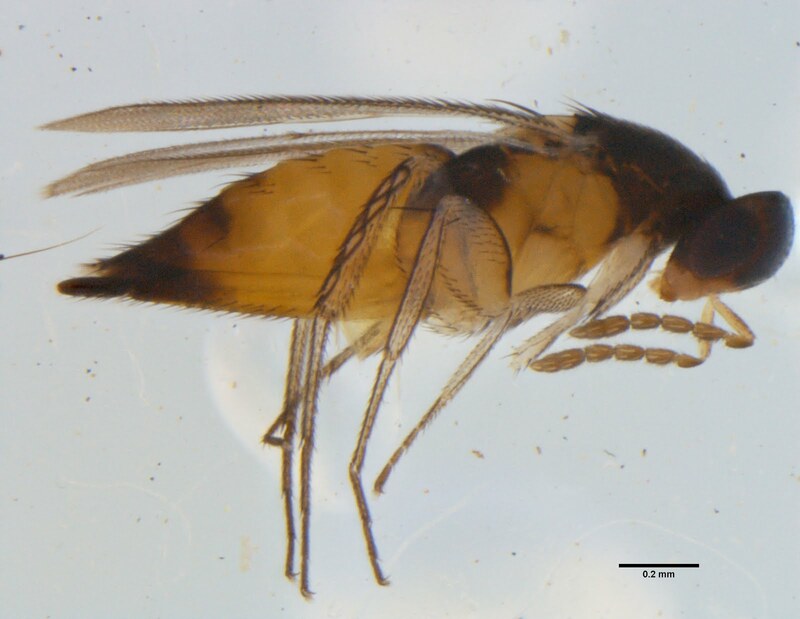 Female Elasmus curticornis Gunawardene & Taylor 2012, newly out today! I can now officially claim not to be a one-trick pony: my first non-harvestman academic paper has just been published. The paper, "New records of Elasmus (Hymenoptera, Eulophidae) species from Barrow Island, Western Australia", written with my co-worker Nihara Gunawardene, is freely available from the Journal of Hymenoptera Research. 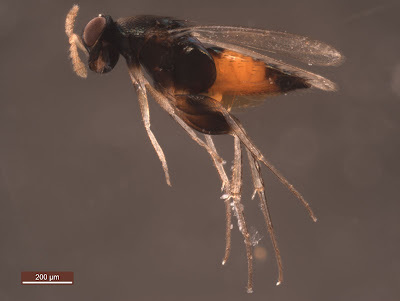 Elasmus is a particularly attractive genus of chalcid micro-wasps that can be immediately distinguished from most other chalcids by their massively enlarged hind coxae, which are shaped like discs, and their long wedge-shaped wings. The Elasmus species of Australia were reviewed by Riek (1967), but most of them were known only from a small number of localities, mostly on the eastern side of the continent. 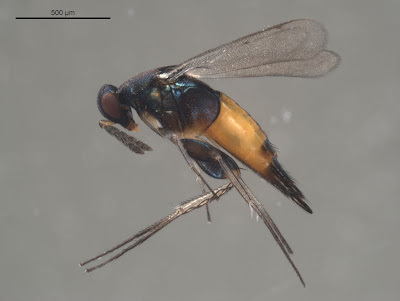 In the course of going through material collected on Barrow Island, Nihara and I identified several species of Elasmus that had not been previously recorded from north-west Australia, and our new paper is mostly a record of those range extensions. Also, as most of the species had never actually been illustrated before, we provided extensive colour specimen photographs. Elasmus ero emma, from Gunawardene & Taylor (2012). Among the specimens, though, were a couple that we couldn't quite match up with any of the species in Riek's paper. They jumped between a few different identifications, but none of them really worked. So we had to broaden our comparisons: a bit of a daunting prospect, may I note, because Elasmus has over 200 species worldwide and I wasn't really keen on the idea of checking every single one of them to see whether they were the species we had on hand. As it turned out, I needn't have worried: the unusually short antennae of this species eliminated all but a few options. And after striking out those options as well, we prepared a description of a new species: Elasmus curticornis Gunawardene & Taylor 2012. The species name means 'short-horned', in reference to the short antennae, and also in reference to one of the other similar species, E. brevicornis, which has an extensive distribution in Eurasia. I did spend a few days pondering whether our specimens might be slightly unusual examples of E. brevicornis: the most obvious difference between the two is that E. curticornis has a much more extensive area of orange on the gaster than has E. brevicornis. Eventually, we decided to go with declaring a new species, and at least none of the reviewers shot us down. I'm still keeping an eye out for more specimens to test our identification, but it doesn't seem to be a very abundant species so far. Elasmus auratiscutellum, photographed by yours truly. Riek, E. F. 1967. Australian Hymenoptera Chalcidoidea family Eulophidae, subfamily Elasminae. Australian Journal of Zoology 15: 145–199. It's early and I haven't had my coffee yet -- when I clicked on the link to this post I thought it was going to be about a short-horned Elasmotherium. You know, our lab is not very big. Between Elasmus and Elasmotherium, I know with which I'd rather be sharing a small room. Congratulations on your first insect paper - may it be the first of many! There's one more in press, and I submitted my first one as first author yesterday, so it's looking like a trend... Not that I don't still have some harvestmen papers in preparation, mind. Nice paper and very nice wasps! It could be very interesting to read more about the Barrow Island project -- how extensive is it?